President Xi Jinping on Tuesday called for efforts to boost Chinese people's confidence and determination to follow the Party along the path of socialism with Chinese characteristics and the path of reform and opening-up. 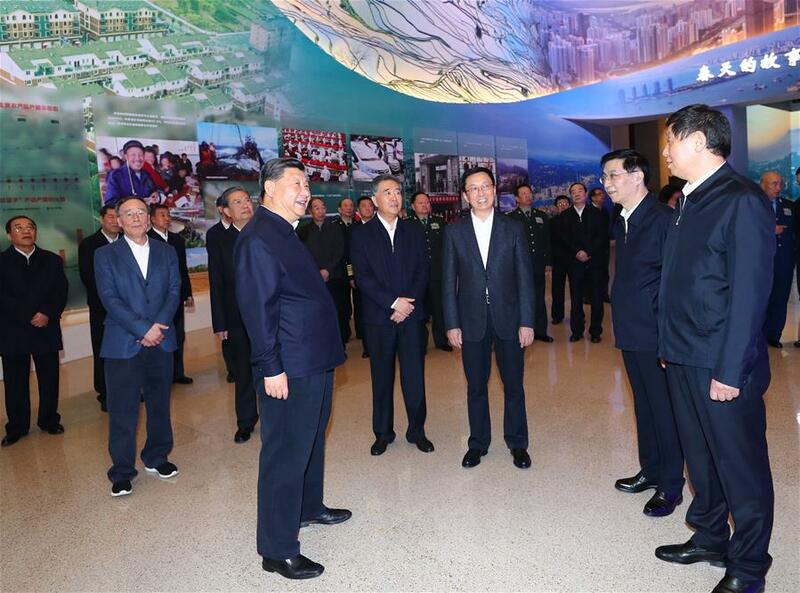 Xi, also general secretary of the Communist Party of China (CPC) Central Committee and chairman of the Central Military Commission, visited a major exhibition to commemorate the 40th anniversary of China's reform and opening-up at the National Museum of China. The exhibition should help build a common understanding, accumulate consensus, raise morale, and foster solidarity and a striving spirit, Xi said. Over the past 40 years of reform and opening-up, the Chinese people, under the strong leadership of the CPC, worked hard with persistence, achieved epic accomplishments and brought great changes to China, he said. Noting that the 19th CPC National Congress had laid down a great blueprint for China's development, Xi stressed that "as long as we continue to take the Thought on Socialism with Chinese Characteristics for a New Era as the guide, fully implement the decisions and plans of the CPC Central Committee, remain committed to deepening reform in all areas and opening wider to the world, socialism with Chinese characteristics will surely have a brighter future." The exhibition should help educate and guide the people to have a better understanding of the strength of the CPC, the Chinese people, and socialism with Chinese characteristics, Xi said. A higher degree of recognition should be built among the people of the Party's theory, the principle and strategic arrangements of reform and opening-up, and the bright prospect for reform and opening-up and socialist modernization, he said. Li Zhanshu, Wang Yang, Wang Huning, Zhao Leji, Han Zheng and Wang Qishan also visited the exhibition. Themed around upholding and developing socialism with Chinese characteristics, the exhibition has six sections, showcasing the history, accomplishments, and experience of reform and opening-up, and the strategic decisions and plans made by the CPC Central Committee with Xi at the core since the 18th CPC National Congress. Exhibits include photos of significant events and decisions over the course of reform and opening-up, and models of the country's Long March rocket series and the Tiangong space station. Xi and other leaders visited the exhibits attentively, and stopped occasionally to ask for more information. ​President Xi Jinping on Tuesday called for efforts to boost Chinese people's confidence and determination to follow the Party along the path of socialism with Chinese characteristics and the path of reform and opening-up.